Obesity is one of the biggest health problems our pet dogs face today. Dogs have mastered the art of begging and tugging at our heart-strings to win a little snack when we’re eating. And many owners give in too easily and too often, while thinking that they’re showing love and affection. But all these extra snacks cause a dog to gain weight. And an overweight dog finds exercise tougher going, leading to more weight gain and a vicious cycle begins. Obesity and excess weight is a very serious condition in dogs that lowers their quality of life and shaves years of their life expectancy. And sadly obesity in Golden Retrievers is an all too common problem for the breed. However, with a little thought and planning it’s completely avoidable and if your Golden is already overweight, then it’s easily reversible. The thing you have to remember is it’s not the dogs fault. It’s the owner that has allowed the weight gain and the owner that has to change their ways to fix the problem. A study by PetObesityPrevention.org in 2012 showed 52.5% of pet dogs in the US were overweight. So in fact there were 20% more overweight or obese Golden Retrievers than the US national average. And that’s 20% more than a national average that is already shockingly high. In the most recent figures available, gathered in 2013, the survey shows 52.6% of US dogs are overweight or obese. So things haven’t improved. But why is this such a problem? The problems can begin when a dog is just a puppy and still growing. Playing simple games like fetch or Frisbee while carrying excess weight can make a puppy highly prone to tendon and ligament injuries. A dog the size of a Golden Retriever carrying too much weight will often form sores and calluses on their hocks and elbows due to the extra pressure put on these areas when laying down. And an overweight Golden lays down a lot! Golden Retrievers as a breed are prone to hip and elbow dysplasia that’s not only made worse by carrying extra weight, but also puts extra pressure on those joints causing a life of discomfort and pain. Finally, and most importantly, the average lifespan of an overweight dog is decreased by up to 2 years, and they have a lower quality of life and maybe even unnecessary suffering during the years they do have. 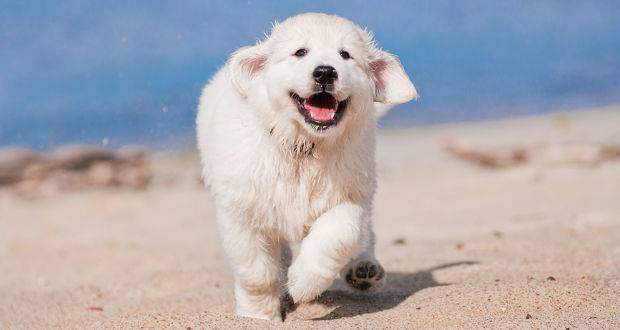 A male Golden Retriever should weigh between 65 and 75 pounds. A female Golden Retriever should weigh between 55 and 65 pounds. NOTE: This is a guide only and later in the article I describe how to check for ideal weight. Here’s a little fun exercise (well, fun is the wrong word I’m sure): I’m going to compare a Golden Retrievers ideal weight and one carrying excess weight, to myself and me carrying excess weight. If you have a Golden whose ideal weight is 70 pounds and they actually weigh 85, this is 21.5% of excess weight. I weigh about 11 stone or 154 pounds. If I was 21.5% overweight, I would be carrying an extra 33 pounds or 2.4 stone, making me 187 pounds or almost 13.5 stone. This is the equivalent of me carrying a 3-year-old child around with me all day, every day. And that’s whether I’d be walking, running, or anything. To me this is astonishing. There’s no doubt I would be slower, more lethargic, and with all that weight, I’m sure jogging or high impact exercise could damage my joints. But for many people seeing an 85 pound Golden, they rarely give it a second thought or think it at all abnormal. 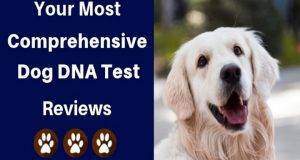 In fact, most people when they see an ideal weight Golden Retriever actually comment that the dog looks thin and underweight! Because the ideal weight of a Golden can vary by quite a margin, rather than using scales the best way to check yours isn’t overweight (or indeed underweight) is to do it by sight and feel. 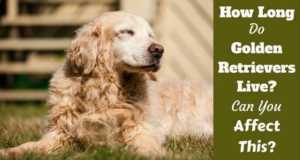 Every 2 weeks or so, perform the following checks to see how your Goldens weight is faring and adjust their food intake and exercise accordingly. How Does your Golden Look? A Golden Retriever shouldn’t have straight or rounded bodies, they should have curves. Looking at your Golden from the side, their tummy’s shouldn’t be straight from front to back, they should have a tucked up area between the ribs and the hind legs. Not as pronounced as a whippet or greyhound, but visible nonetheless. Furthermore, if you stand over your Golden looking down from above you should see the classic hourglass figure. There should be curves where their body tucks in between the ribs and hind legs. Again, not so much that it’s pronounced, but it should visible. If this tuck isn’t visible from the side or from above, then it’s very likely your Golden is overweight. But it shouldn’t be too pronounced else they’re too thin. How Do your Goldens Ribs Feel? Although your Golden’s ribs shouldn’t be visible, you should be able to feel them. Putting your hand on either side of your Goldens chest, with just very gentle pressure (almost lightly touching) you should be able to feel every rib. If you can’t, then your Golden is overweight. But be aware if you can see them, then they’re underweight. Also, if you start with your hands on your Goldens chest and run them down their body toward the back-end, you should be able to feel a definite waist. If you can’t then they are overweight. You shouldn’t concern yourself too much with the weight of a growing puppy. It’s rare that a puppy will overeat and as they grow their bodies will go through many changes. A puppy’s overall look can fluctuate between looking thin and slightly podgy but this is normal. Obviously if they start to look drastically overweight and quite visibly so, then you should take some action. But this is something you will very rarely see. Puppy’s usually start carrying a little ‘puppy fat’, then grow into quite thin and athletic looking adolescents. They will reach full height at some point between 12 and 18 months old, but still be filling out and building muscle after this time. So a puppy should rarely be put on a diet, particularly because malnutrition may then become a problem. Unless your puppy really is looking obese, don’t concern yourself with it. But make sure to ask your vet about their weight during each visit so you can have an informed second opinion. That said, your puppy’s nutrition is extremely important and is something you want to get right because their entire future health depends on it. 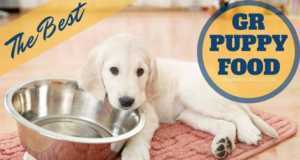 If you need advice on the best food to feed, please read our article: The Best Puppy Food For Golden Retrievers. 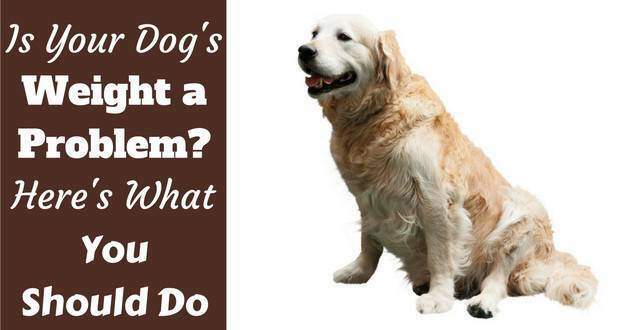 The very first thing you have to do before tackling the problem of an overweight Golden is take them to the vet for a check up and to get some professional advice. Sometimes excess weight is caused by medical problems, for instance due to low thyroid function or fluid retention, and this must be ruled out before any diet or exercise is given. Secondly, there are many problems that a diet or exercise might make worse. For instance if your dog is arthritic or has dysplasia and you start an increased exercise regimen, you could make these problems worse and cause discomfort and pain. So don’t just blindly act, ask for the advice of your family vet first so you’re sure to be doing the right thing. 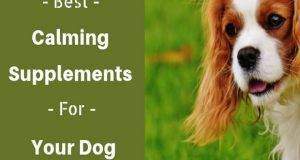 But once given the all clear medically, there are a few things you can do to help your Golden Retriever lose weight. Treats when training, scraps from the table, a biscuit from your children and snacks found and eaten when out and about, these all add up and sometimes to a surprisingly high amount of calories. So the first thing you want to do is watch how many treats they’re given. If you’re giving treats when training, these calories must be subtracted from a main meal to maintain the same number of daily calories consumed. And if your children, spouse, other family members or visitors ever give your Golden little treats, these simply must be stopped. Inform everybody and tell them why. And table scraps should be stopped completely. Usually they’re too high in salt and other things not good for dogs anyway, so really you should just avoid this. And please note if you do feed human food snacks, always be mindful of what you feed because although many foods are safe, some are toxic and a good number fit only somewhere in the middle as explained very well in this article: Can dogs eat bananas? Very often, a more mindful approach to treats and snacks is all it takes to keep a dogs weight in check. Most owners feed their dog all they need at meal times and it’s the treats and snacks on top that cause the problems. A simple fact is if the calories in are greater than the calories used, then a dog will gain weight. If calories in are less than the calories used then a dog will lose weight. Exercise increases the number of calories used so it’s a great way to lose weight…as long as the number of calories going in isn’t increased to compensate. So you should aim to increase the overall activity levels of your Golden. This will have a dramatic effect on their weight but not only this, it will also improve their overall health in many ways as well as enrich their lives. A word of caution though. You should introduce exercise slowly and gently before building up the intensity. You cannot ask an overweight dog to suddenly start chasing tennis balls and jumping logs and streams. This can cause many problems and particularly damage to their joints. Start slowly with 20 minutes of power walking on flat ground. Then over the course of days introduce slopes and hills. 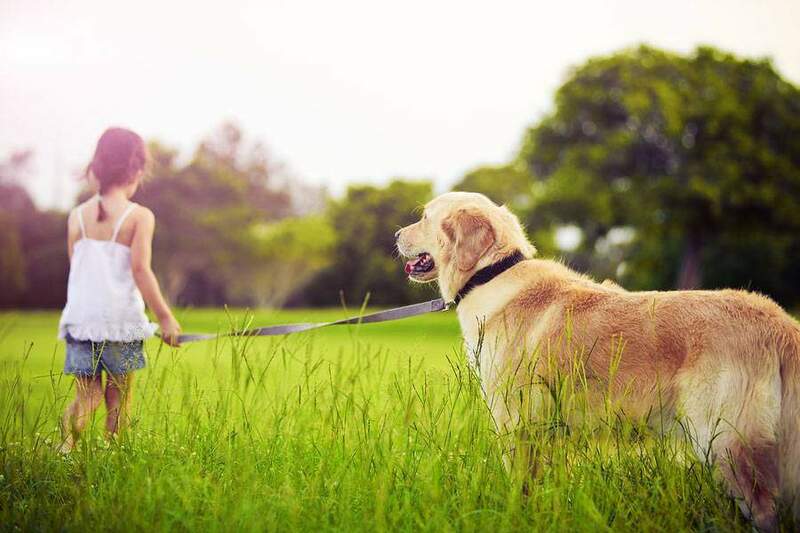 Once their fitness increases and the weight starts to drop off, introduce gentle jogging and playing fetch. And of course swimming is always a great form of exercise for any Golden Retriever. Some owners feed their dogs and just leave the food bowl down all day, allowing their dogs to help themselves when they feel like it. If you have an overweight Golden and this is how you feed them, you need to make a change. With constant access to food, a dog’s body starts to work inefficiently and this can lead to weight gain. Maintaining weight works best when fed on a fixed schedule. Secondly, you should feed your dog twice each day and not just once. Feed them first thing in the morning and once in the early evening. If you feed your dog just once each day, their bodies go into a ‘starvation mode’ daily where their metabolism slows for most of the day due to having an empty stomach. Food absorption becomes highly efficient, and the body tries to hang on to as much fat and energy as possible due to few opportunities to refuel. This promotes weight gain so we want to avoid this. There are many, many different brands and types of dog food on the market. There are even some specialty ‘diet dog foods’ you can buy. Some of these foods are high in fat, high in fillers, high in cheap low quality food stuffs and more besides. Poor quality food can lead to a dog’s body working inefficiently and this can lead to weight gain. 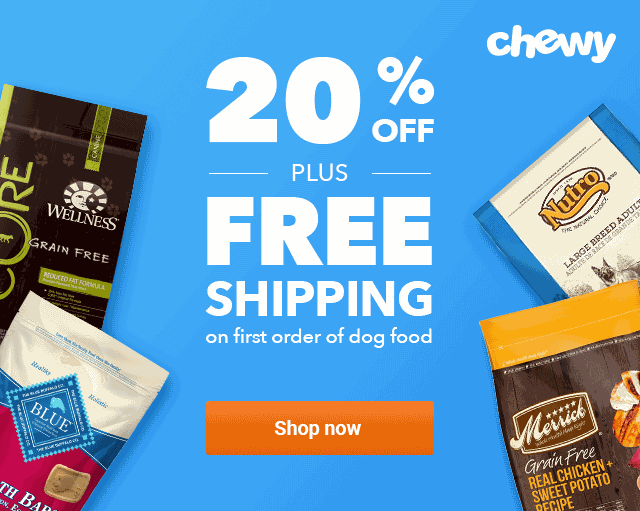 Find a high quality and nutritious dog food that your Golden enjoys and stick with it. Feed twice to three times per day so your dog doesn’t feel empty and avoid cheap calorific foods. There’s also no need to feed diet dog foods. Just feed quality food in the correct amount and exercise your golden. Almost all dog foods come with guidance on the packet stating how much to feed your dog but you have to remember that these are just guidelines. They simply cannot be right for all dogs whose size and exercise levels vary greatly. It also has to be said that many owners fail to measure the amount of food they give their dogs at all. So if you aren’t already using one, buy a measure and feed your Golden the same amount split over two meals every day. If you’re watching the treats and exercising them well, yet they still put on or maintain being overweight, quite simply you’re overfeeding them. Reduce their food by 10% and monitor things for a few days. The weight should start to fall off. And of course going forward, all other things like treats and exercise remaining constant, you can control their weight by careful measuring of what they eat, adjusting up and down depending on their current look and feel. Most dogs and especially Golden Retrievers, will eat themselves to death if given the chance. Us owners are the only ones who can control their weight as they just won’t do it themselves. Obesity and being overweight directly leads to many health problems and for those unfortunate dogs who have existing medical conditions, carrying excess weight can make things worse. Goldens with arthritis, dysplasia or other joint and bone problems will suffer heightened discomfort and pain due to the extra pressure on joints if they’re overweight. Shaving off any extra pounds will give them more mobility and ease their pain and suffering, directly leading to a higher quality of life. In this article I’ve given some good ways to measure and monitor your Golden’s weight, and some solid advice on how to keep it under control. If your dog is overweight, now is the time to act. I’ve never met an owner who didn’t hate the fact our dogs are with us for such a short time. We can extend our dogs lives and make the time they do have so much more enjoyable by making sure they’re fit and healthy. 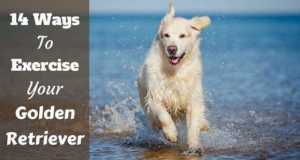 A fit and healthy dog is a happy dog, with a higher quality of life to enjoy for a longer amount of time. It’s up to us to make this a reality. This was very helpful. My golden is 10 years old and has a weight problem. He’s 20 pounds over and it has been a struggle to get it off. I will try the tips you have given . Thank you!! Thanks for the article. I also have a 10 yr old male golden. He was normally abt 70 lbs during his winter checkup. He has crept up the last few years and this year he was a little over 80-1/2 lbs. We live in Michigan so exercise is difficult in the winter. He also had a sprain for a couple of weeks. I have been feeding him Nutro® Farm’s Harvest Dog Food. It recommended 3-1/4 cups of food for a 65 lb dog. That was the highest weight it went up to. After his appt 2 months ago I cut him back to 3 cups but he gets a treat or 2 per day and little nibbles of table food. I took him to the vet this morning because he all of a sudden started bleeding from one of his nails. He had only lost 1 lb. I was so disappointed. All his front nails were shaved down and he hasn’t been groomed in a couple months. The only thing we could think of is that they were shaving down while he was walking/running on the cement. That has never happened before. He also had a droopy eye and has Horner’s Syndrome. He started itching his ears a couple years ago and we switch foods a few times (kangaroo, duck, etc), removed treats and table food. Was never able to figure out what he was allergic to so he takes 1/4 steroid pill every 3 days. I don’t know what else to do to help him. You saw the vet, did you ask them and bring up your concerns? They will have the best advice…and to be honest, the only source of advice you should follow! I also see you mention ‘treats and table food’, well these can soon add up. You need ot be honest with yourself – and the vet – and see what you are truly giving him. And a common problem is other family members, and visitors feeding a dog little treats that are completely unknown to you. You need ot make it absolutely clear to EVERYBODY that you are controlling your dogs diet and they must not give him anything…depsite those well practised, hard to ignore, longing puppy eyes they give when there’s any food in the vicinty, lol. I just adopted a golden. His parents came into work begging me to take him. So of course i said yes haha. But there is 1 problem. He is 128 pounds. WAY over weight. Help???? The advice above should be of help? My Golden, name Bodashous Sharlay, is 13 and 15 pounds overweight. I’m shocked and feel guilty that his unhealthy weight and his exercise habits or the lack thereof rests solely on my conscious. I have always free fed my dogs in the past and they lived 15 years. Sounds pretty silly that I never thought otherwise than to free fed. Is it the breed? My past dogs were German Shepards. What would be the top 3 brands of dog food would you recommend- and how much would I feed him in the morning and early evening? My golden, Molly, is almost 12 yrs. old. About two years ago she weighed 112lbs. Today,when she returned from the groomer she was 63lbs. and I was told she was underweight. She lost seven lbs. over the summer. I feed her two cups of Beneful healthy weight dry food twice a day. I used to feed her one packet of that semi dry food that looks like hamburger along with the Beneful plus occasional treats. Cut out the two packets of food, continued to feed her the same amount of Beneful, and slowly went on a consistent exercise program of walking/jogging EVERY day for about two miles. Always on the leash. She used to have trouble climbing the stairs or even jumping up on the sofa. Today she looks and acts like a puppy, chasing squirrels at full speed,jumping up on her hind legs and wrestling with all the strength she once had. JoJo, it takes discipline and determination to lose weight. This goes for humans as well as dogs. There is no secret formula, fad diet or magic pill for this. It’s all about calories in vs. calories out. So, wherever you live I can’t imagine a situation where you cannot walk or jog your dog each day. 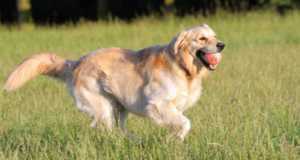 Golden Retrievers are sporting dogs and require vigorous daily exercise. If you won’t do this I suggest getting a lap dog instead. Im so glad to hear about Molly. My golden is 9 yrs old and is overweight! Back in the day, I used to run with him, but now my work schedule prevents it (that and the fact that is 21 degrees out)! He weighs 108 and Im really concerned. I have restricted his eating and am walking him as much as possible. Im glad to hear that you and Molly have had success with the dieting! Thanks for sharing your story! This is super educational and extremely helpful. Our little boy is also 10 years old and has been fighting weight issues for the last 2 years. Thank you for such informative advice. Otis allegedly just turned twelve. I rescued him about 8 years ago from a lady that couldn’t take care of him anymore. He was 87lbs back then. I bought a farm and he got much more exercise, but also started supplementing with squirrels, cottontails, and even a jack rabbit. My parents took care of him for about a year and a half until I returned for good from a work need. But he had gotten up to 112 lbs. I have been sorking with him to get his weight down but he hovers around 100. Do you know how many calories in a ground squirrel? The vet says to feed him for the weight he’s supposed to be. It seems a shame for him to have to be on a leash on the farm so he doesnt hunt and eat as much. I could put a muzzle on him, but if he gets out to far and has to fight a coyote, I dont want him to be defenseless. Good clear article. The more people that understand about housebreaking their dog / puppy as soon as possible the better.